1:35 Italeri M163 A1 Vulcan; 1:35 Dragon Flammenwerfer SS-Division Ostfront 1941; 1:35 Tamiya StuG. III Ausf.B; 1:35 Trumpeter KV-1 (KV small turret) (mod. 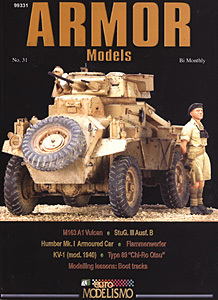 1940); 1:35 Sovereign 2000 Humber Mk. I Armored Car; 1:35 Gum Ka Type 89 'Chi-Ro Otsu'; Modeling Lessons - recreating boot tracks.